“Wouldn’t it be wonderful to see a dance piece where the dancers dance in the first act, and in the second showed the audience how to dance? Wouldn’t it be wonderful to see a musical where in the first act the actors sang and in the second we all sang together? What would also be wonderful would be a theatre show where we, the artists, would present our world-view in the first act and where in the second act, they, the audience, could create a newworld. Eva is in her office, at work. The scene shows friends, the Boss, day-to-day problems, the process of finding new projects to work on, the daily grind of a hard life. Eva is at home; her husband is out of work, their daughters are spendthrifts, they need money. A Female Friend drops round, they go out. They go straight to a demonstration against the construction of atomic power plants. Back at the office. The Boss comes in whooping with joy: a new project has been accepted! Everyone celebrate the news! Champagne is consumed! Joy unbounded…. till the Boss explains what this new project is about – the development of a refrigeration system for a nuclear power station. Eva is torn; she needs work, she wants to support her fellow workers, but this situation poses a moral problem for her. She gives all the reason she can for not accepting this new project, and her colleagues give their opposing reasons. Finally Eva gives in and accepts the job! In this piece it was clear that the protagonist was going to have to commit an error and not be heroic. The audience almost cried when Eva gave in. And the effect of this was an extraordinary intensification of the fight – the game of actors/oppressors against spect-actors/oppressed – when it came to finding reasons for Eva to say no. Each time a spect-actor gave in and saw that she was beaten, the piece rapidly retraced its path towards Eva’s ‘Yes’. Passions in the audience ran high again till someone shouted ‘Stop!’; then the scene stopped a new spect-actor tried a new solution starting from the first action, or the second, or even the third. Everythin was analysed: the husband’s unemployment, the daughters’ mania for consumption, Eva’s indecision. Sometimes the analysis was purely ‘psychological’, then another actor would come in and try to show the political side of the problem. Should we be for or against nuclear power stations? Can one be against scientific progress? Can the word ‘progress’ be applied to science when it leads us to the discovery of nuclear weapons? And on the question of the disposal of ‘nuclear waste’: surely it could be satisfactorily disposed of in a social system whose central value was the human being rather than the profit motive. Anti-nuclear protest, near Idinthakarai, Koodankulam. September 13, 2012. Confirmed Updates, Idinthakarai, Koodankulam: 11 September 2012. 10.00 a.m. Given the large number of conflicting reports that have been making the rounds, a few of us — informed by reliable local sources — have attempted to reconstruct the events leading up to the current situation based on confirmed information. Information, where unconfirmed, is indicated. Based on eye-witness reports by Amrithraj Stephen, interviews by Nityanand Jayaraman, Revathi and Amritharaj, and updates and articles published on internet. Friends in the media have reported that all top police brass have gathered in Koodankulam to chalk out a strategy to wipe out the movement. According to the media sources, intelligence officials are reporting that two women police are missing and are untraceable. Villagers say that no policepersons have been taken hostage. It is feared that this rumour is being used to fuel public opinion against the protestors and to justify any repressive action by the police against villagers. In this context, to pre-empt any untoward incident, Mr. S.P. Udayakumar has announced that key leaders of the movement will surrender tonight at Koodankulam Police Station in the presence of prominent political leaders. Responding to the Atomic Energy Regulatory Board’s clearance to commence nuclear fuel loading in the Koodankulam plant, the People’s Movement Against Nuclear Energy announced that protestors would lay siege to the plant on 9 September. Police force was deployed in huge numbers in the area. On that day, between 8000 and 10000 people, including children and women from Idinthakarai and neighbouring villages started from the Lourde Matha church in Idinthakarai. They walked down the coastal path avoiding the road route and were stopped by the police around 800 metres away from the plant. The protesters sat down on the sea shore and said they will continue their struggle from there. S.P.Udayakumar, co-ordinator of the struggle committee, announced that they want the Tamilnadu government to intervene and respond to the demands of the protesting masses. All the protesters stayed put on the sea shore braving the weather and other hardships. On the morning of the 10th of september, the police came in with the strike force resorted to a tentative lathi charge around 10.30 am. After a scuffle that lasted a few minutes, police withdrew to a distance and uneasy calm prevailed. “The situation is back to normal,” a protestor told us at 10.30, as if anything about the situation could be considered normal. The congregation of mostly baton-wielding police forces swelled in size. A large riot-gear bedecked police force was in the frontline facing the people, and tear gas lobbers were on stand-by. After sometime two young men on a fibre boat tried to go towards KKNP. The protesters were against this and took permission from the police and went towards the young men and spoke them back to the place they were all sitting. As the two young men came back the police according to the Tirunelveli SP Vijendra Bidari’s orders, nabbed them. This caused unrest amongst the protesters and they argued with the police, asking why they’re arresting them after they have come back. Around this time at 11.30 Tirunelveli SP Vijendra Bidari announced the protesters to disperse in ten minutes failing which police will take action. Women formed the first line of protestors and were closest to the plant, while the children and men strung out along the beach towards the Idinthakarai village. Just before the strike began, DIG Rajesh Das instructed the strike force to move towards the centre of the congregation and enter from the centre so as to divide the women and men. As we could see from the live telecast, many teargas shells were lobbed and police went into the crowd in force and resorted to heavy lathicharging. Caught between a tide of armed police and the ocean, women and children tried to throw handsful of sand at the policemen to escape lathi blows; children were caught in the melee. A large number of men jumped into the sea, even as members of the Rapid Action Force were caught on television pelting stones,sticks and slippers at those at sea. The police were threatening those wading in the sea with death and bodily harm upon their return to the beach. At one point, the source of this information heard a policeman pointing out to a youth holding a mobile phone and shouting that he was holding a bomb. The source intervened to point out that it was a mobile phone. Sahaya Initha, a prominent leader of the movement and a ward councillor, was targetted by the police and badly injured. In a television interview, S.P. Udayakumar, who had by then moved to safety, said that he had been shot at. This incident was confirmed by other by-standers who said that shots were fired at the fibre boat in which Udayakumar was attempting to leave the site. Several media persons were injured, and at least one cameraman from Times Now was intentionally targetted. With most of the action centred around the seashore, a separate posse of policemen went about systematically breaking the vehicles used by protestors to come to the protest site. Only one cameraman, from Times Now, was present videographing the actions. The police attacked him causing serious injuries. He required at least four stitches above his eyebrow. His camera was destroyed and thrown into the sea, and the videotape reportedly removed. Unconfirmed reports state that the motorcycles belonging to three media persons were also damaged in the police action. A Dinakaran reporter was roughed up, and the Makkal TV reporter was pushed into the thorns. 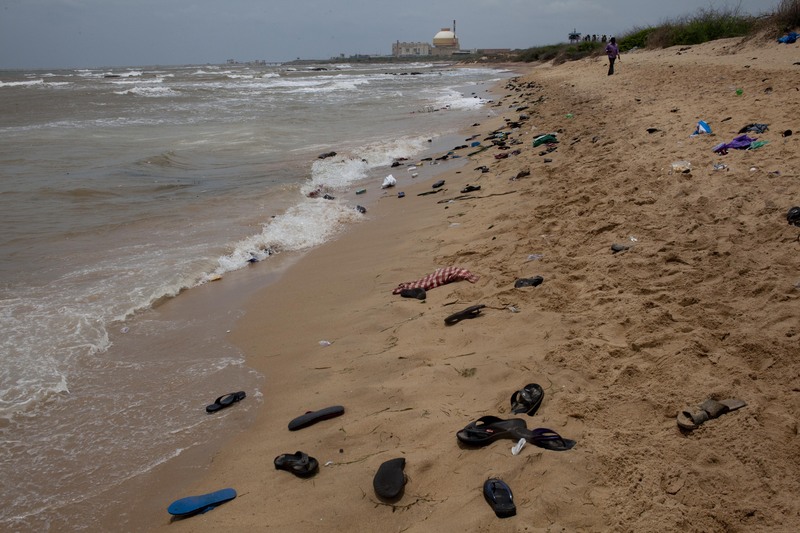 Following in the heels of the departing people, the police also systematically destroyed the expensive outboard engines on the boats parked on the beach. One constable was working to set fire to the pandal, but stopped when he saw a photographer (the source of this information) poised to capture his act on camera. The photographer then alerted the Puthiya Thalaimurai reporter Mr. Ramanujam. The constable tried one more time before giving up, and angrily told the photographer that the latter was disrupting his work. The pandal on the seashore was pulled down. The lights and speakers were broken. Sand was thrown in the food that was prepared for lunch by the protestors. During the course of the melee at the seaside, a separate force of about 400 police persons entered the Idinthakarai village. The media was busy covering the riot-like situation on the coast and did not accompany the police force that went to Idinthakarai village. The police went door-to-door searching for men. When they reached the seaside, they saw about 150 to 200 youth gathered there. The youth dived into the sea to take refuge, while the police opened fire and taunted them from the shore threatening them with dire consequences when they return to shore. It was during this time that the police desecrated the Lourdu Matha shrine. Idols were broken. Policemen spat andurinated inside the church. The pandal (tent) erected to provide shelter to the protestors was pulled down, and the lights vandalized. The water cans were broken. The Tamil Nadu Water and Drainage Board’s public water supply point in Koodankulam village too was reportedly broken. Women who were watching the goings-on from hidden vantage points also reported that unknown men in white dhotis and shirts were seen stoning police vehicles with the police photographing the same. News reports stated that the Panchayat office and the local TASMAC (Government-owned wine shop) in Koodankulam were set on fire by the villagers. However, the villagers in Koodankulam insist that no such incident happened. They admit that the awning (asbestos shelter) protruding from the wine shop was damaged. But neither the Panchayat office nor the TASMAC shop were set on fire or damaged. Later in the evening around sixty five people were arrested from the Koodankulam village. Between 2.00 pm and 3.00 pm the police carried out a house to house search. Last evening, the police entered the Tsunami Colony in Idinthakarai and conducted a door-to-door search. They also reported damaged a few of the houses. An uneasy calm prevails. Essential supplies to Idinthakarai village have been blocked. All of yesterday, there was no water, especially since the water reserve was emptied by the police forces. As of 9.30 a.m. on 11 September, no supplies have been allowed to reach the village from beyond Thomas Mandapam, the location of the police barricade. One tractor-load of water was brought in at around 9.30 a.m. from a local source. At the end of 10.09.2012, we got news that electricity connection to 5 villages has been cut off. Reports say that phone lines many of the villagers are being tapped in order to locate UdayaKumar and the struggle commitee leaders. Within hours of the police crackdown, protests across the fishing villages across Southern Tamilnadu spread like wildfire. One fisherman, Anthony Samy (40 years) was shot dead in Manappad village, Thoothukudi district. More than 10,000 protestors staged a rail roko at Thoothukudi station delaying the Mysore Express by more than 2 hours. A journalist source reported to Dianuke.org that the DIG Rajesh Das had told him that 25 people were arrested yesterday. One child from Koodankulam was reportedly hit on the head by a tear gas shell, and is said to be in a critical stage in the Tirunelveli Medical College Hospital. At the time of writing (September 11. 10 a.m.), no confirmation could be obtained about this incident. Anti- nuke activists arrested: 3 anti- nuke activists Suseendaran, Vivekanandan and Thirumurugan were arrested by the DC Saidapet when they went to extend solidarity for the protesting students of Nandanam Arts and Science College. They were released at around 7:30 p.m.
Tamil Nadu has a long tradition of using excessive force to quell protests particularly by marginalised communities. In 1999, 17 dalit tea estate workers were chased into the River Thamiraparani in Tirunelveli district by a baton-charging police force which had descended to quell a strike demanding better working conditions. Exactly a year ago, in Paramakudi, the police violently broke up a dalit gathering to honour their leader Immanuel Sekaran’s, gave hot chase to fleeing people, and shot and killed six dalits and injured more than 30. Students from Nandanam Arts and Science College staged a lock-in at their campus . Human Rights Protection Council staged a dharna at the Madras High Court. Ma Kaa Ee ka, staged a protest at Panagal Malligai and news report say that 30 people were arrrested. Manitha Neya Makkal Katchi staged a protest in Parry’s Corner and news reports state that 300 were arrested. Amidst heavy police presence, a dozen protestors submitted RTI applications at the Nuclear Power Corporation of India Ltd’s office in Egmore, Chennai, demanding information within 2 days because the matter concerns the lives and liberties of local residents. Advocates protested at the TIruchi District Court campus. Ma Kaa Ee Kaa staged a protest at Tiruchi Bus Station along with support groups. Law college students staged a protest and were lathi charged and dispersed. Members of Naam Thamizhar blocked a road. Nearly 10,000 people, including a large number of fisherfolk, are reported to have staged a protest in front of the Lady of Snows Church in Thoothukudi. All nationalised banks pulled down their shutters in solidarity. Protestors also staged a rail roko and blocked the Mysore express train. Fisherfolk rallied against police atrocities. One man shot dead. Naam Thamizhar and other supporters blockaded the main road near the Tirunelveli junction. About 40 protestors were detained and released in the evening. Koodankulam solidarity protest took place in front of the TamilNadu Bhavan, New Delhi.